After a lazy morning in with more croissants, fruit, and yogurt, we headed out for a day at the park. 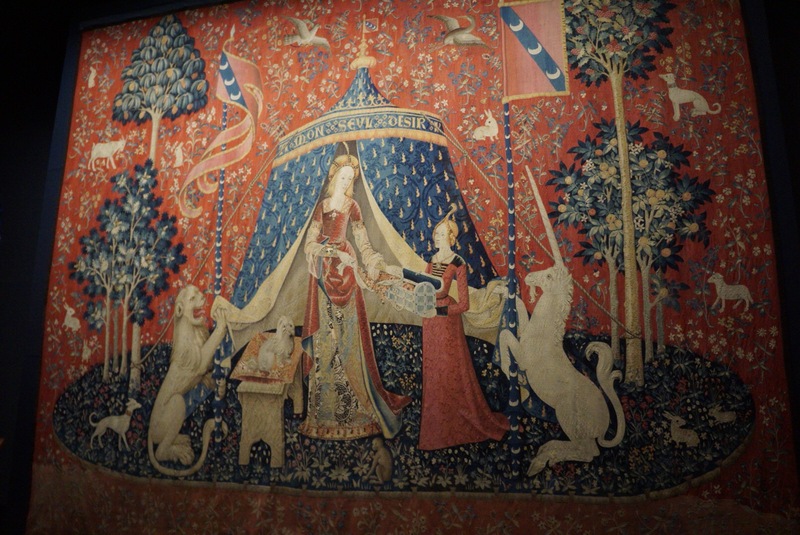 Passing by the Centre Georges Pompidou along the way, our first stop was to the Musee Cluny, the Medieval Art museum. 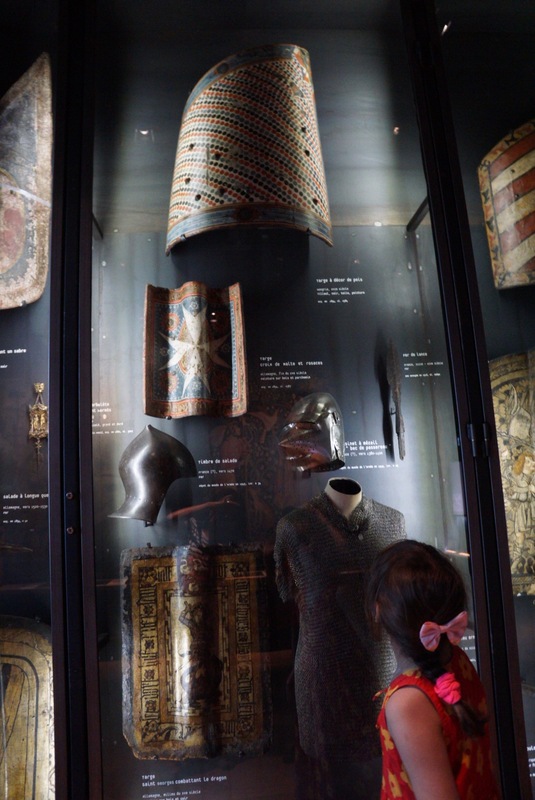 It is housed in one of two remaining Medevial buildings in Paris, and contains multiple medieval artifacts and the ruins of old Roman Baths that used to be onsite. As always, I’m a sucker for anything fiber arts related, and they have a room with seven other “lady and the unicorn” tapestries, clearly a popular motif of the middle ages. Was it the only art form of the time which allowed phallic symbols? Perhaps so. 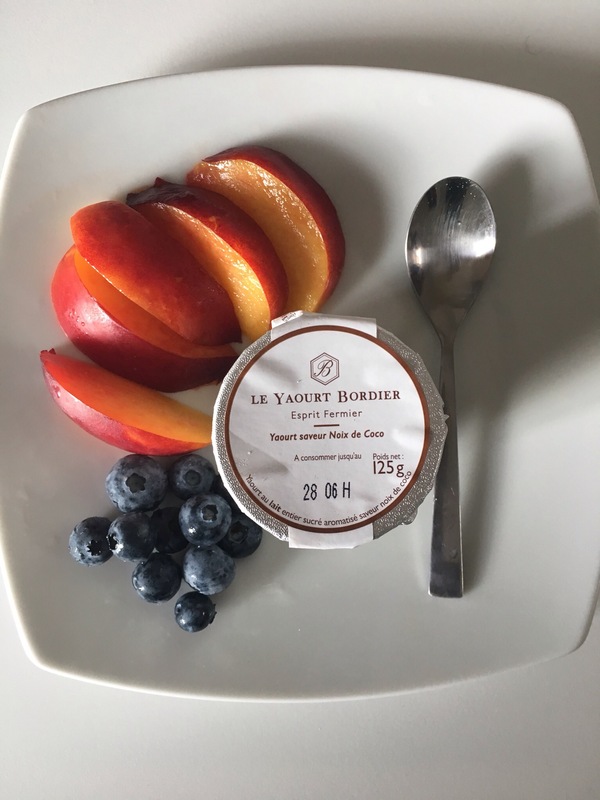 Really, the tastiest yogurt ever. Unicorns! Lions! Monkeys! and a millefiore background. This tapestry has it all. 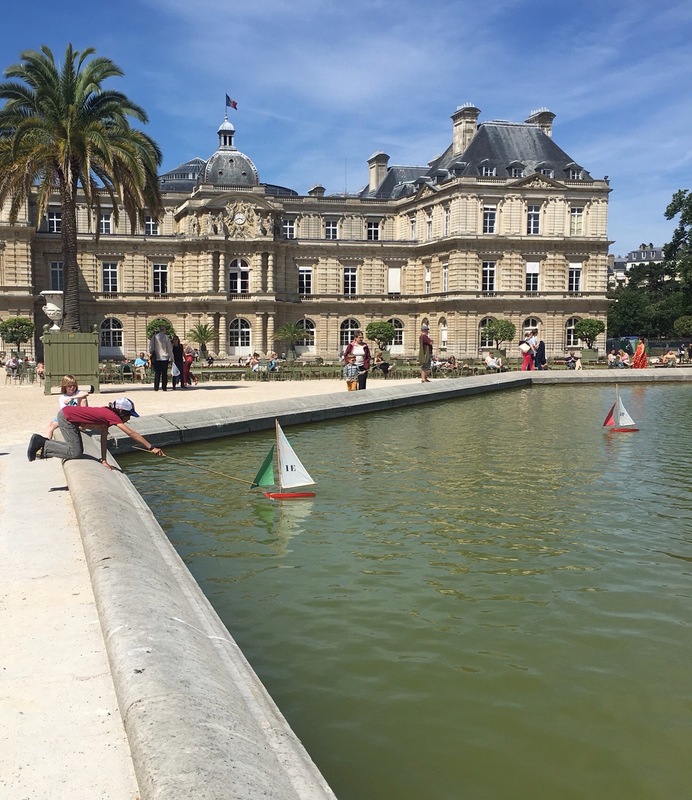 We strolled down to the Jardin de Luxembourg, intending to pick up bread, cheese, and vegetables along the way for a picnic. I assumed that I’d be able to walk up any street and see a million fromagerie and boulangeries. While there are a lot, they do need to be found. We wandered around for longer than I would have liked in the hot Parisian noontime, and I resolved next time to pre-pick some selections and save them to my googlemap. We found a fromagerie on that app and headed over. Upon entering what was actually a food hall type of place with many smaller vendors, we found the cheese shop closed. I walked over to the butcher next door and asked in French, “What time does the cheese shop open?” “Not until 4 pm!” she explained. “Oh…” I replied, “We were hoping to get cheese for lunch. Do you think the Marks and Spencer food shop next door would have some?” At this she visibly shuddered and placed her hand on her chest, as if to say “God forbid one eats cheese from Marks and Spencer.” I didn’t have the heart to tell her that for this American, cheese from Marks & Spencer in Paris would probably be tastier than anything I was used to back home. 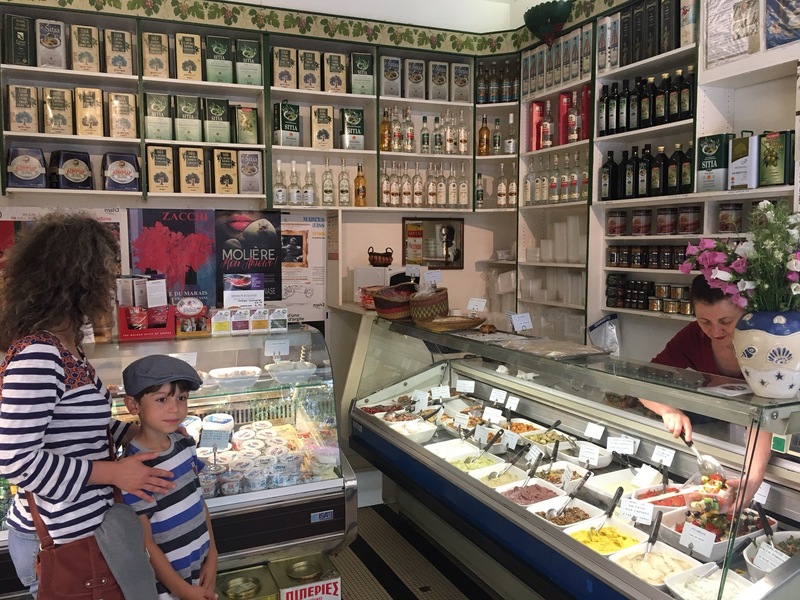 She told us to go up the street for an open cheese shop, however upon following her instructions there was nary a fromagerie to be seen. We ducked into a Carrefour supermarket, away from her offended eye and bought some brie and comte, some fruit, veggies and two bottles of Heinekin and headed to the park. We got waylaid by a pastry shop and picked up a lemon tart too, because Paris. Friends, thus began a perfect afternoon. Walking into the garden from the North entrance, we found ourselves on a path lined with trees that opened into a plaza with a pond in the center. Beyond were rows of larger trees fiercely manicured into severe rectangles arrayed in rays extending southward. I kept remarking to Eric that I felt we’d wandered into an impressionist painting! Finding a shady bench, we set up shop, tearing the bread apart and slicing the the cheese and vegetables into it with a plastic knife. Eric used his bottle opening ring to pop the caps off the beers, and we munched away in happiness. Below us was a pond where colorful wooden boats lazily made their way around in the breeze, chased by children holding long slender bamboo poles. When the boats would reach the edge of the pond, the poles were used to push them off into the center again, their little sails billowing out when they caught the wind. I like to send the kids out on small missions in foreign countries, especially in ones where they don’t speak the language. I feel it helps them to learn how to operate in unfamiliar circumstances, and at this point they’re comfortable with this. They went down on their own to find out how to rent boats and how much it cost, scurrying up a few minutes later with the verdict – 4 euros for 30 min. I handed them a 10 note and off they scampered to get their boats. The boats sail for a country – the boy wanted Japan but it had been taken, so he settled for Ireland instead. The girl, she sailed for Spain, and I suspect it was partly because her boat would then match her dress. 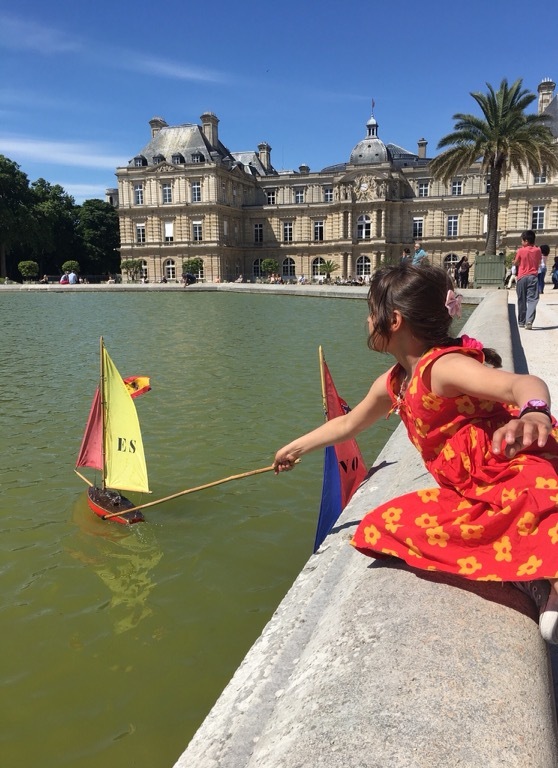 Without electricity or motors, children happily sent the boats around the pond, devising races and competitions. Beware though – some flags look quite similar, as the boy discovered when he found a little pirate trying to poach his Ireland boat instead of the India boat that he actually owned. The cheek! 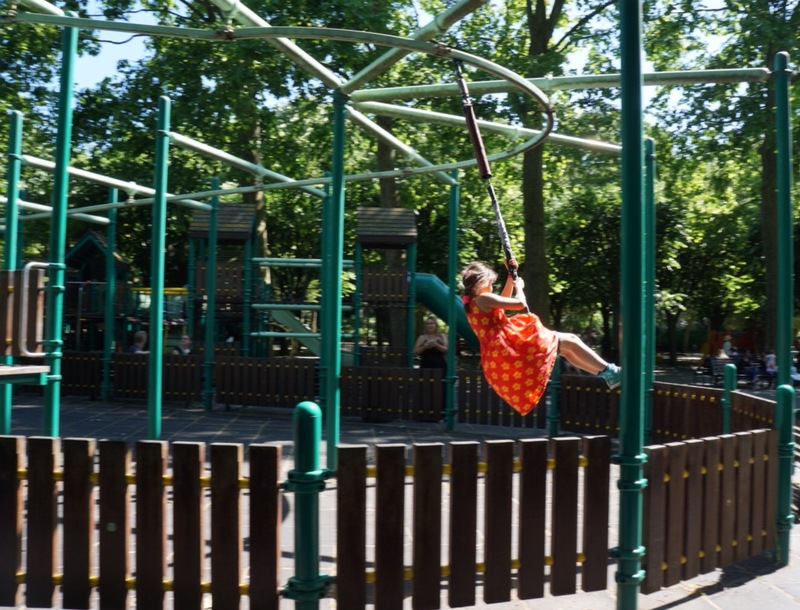 Once the maritime adventure ended, we headed over to the large playgrounds. 2 euro for the children to enter, and 1 for the adults. Eh, I could take pictures from outside the fence and save 2 Euros. We handed them enough coinage and found a bench where we could watch in but not actually have to sit among the running bulls. As it was before 3 and not Wednesday (because French children just don’t have school on Wednesday) it wasn’t terribly crowded. The kids befriended a couple of other visitng American kids, Eric took this time to enjoy a nap in the shade, while I read a book (The Sympathizer) and took a few pictures. We ended up spending almost four hours total in the park, and enjoyed every single second of it. We popped down to the metro and found it…packed. Cheek by jowl (and guarding our pockets) we made it home and conjured up dinner. This evening from Maison Plisson, a high end small grocery store and cafe around the corner from our flat, akin to Dean and DeLuca. 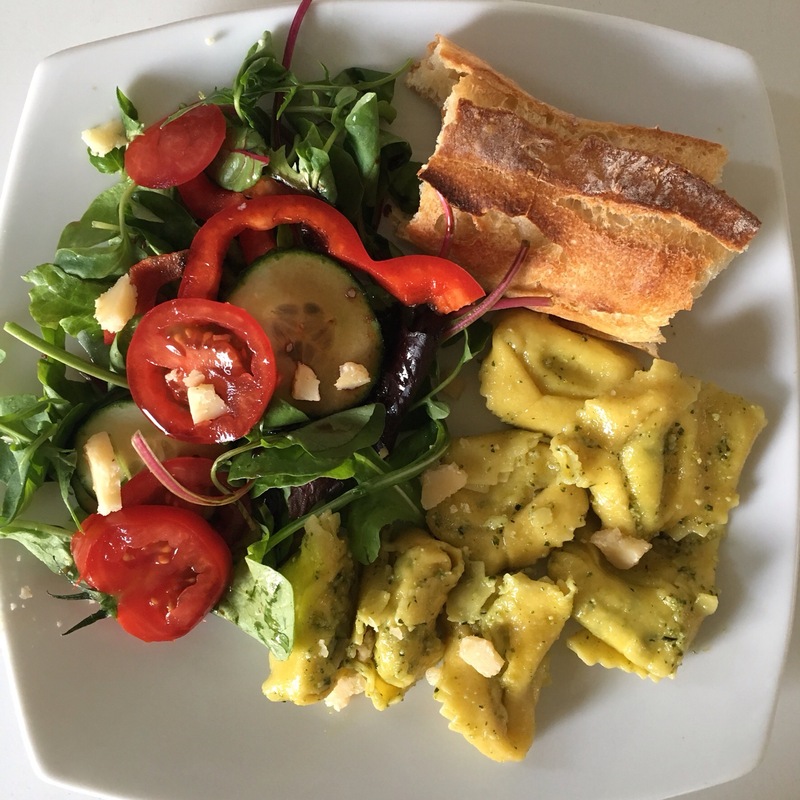 Fresh ricotta and spinach tortellini and a side salad made a perfect summer meal. After dinner, we let the kids entertain themselves (translation: play Minecraft and some game called Animal Jam on the iPad) while Eric and I scouted out some speakeasy cocktail bars in the area. The first one was Candelaria, in which you walk up to a hole-in-the-wall taco joint with maybe six seats in it, serving up fresh tacos off a flat grill. At first we looked at each other, thinking, this can’t be the place, but then we saw someone exiting through a false wall in the back! We slid on through and found ourselves in a small well lit space, the bottles behind the bar glowing from golden light. We texted the kids, and as they were fine we decided on another stop – the Red Door. 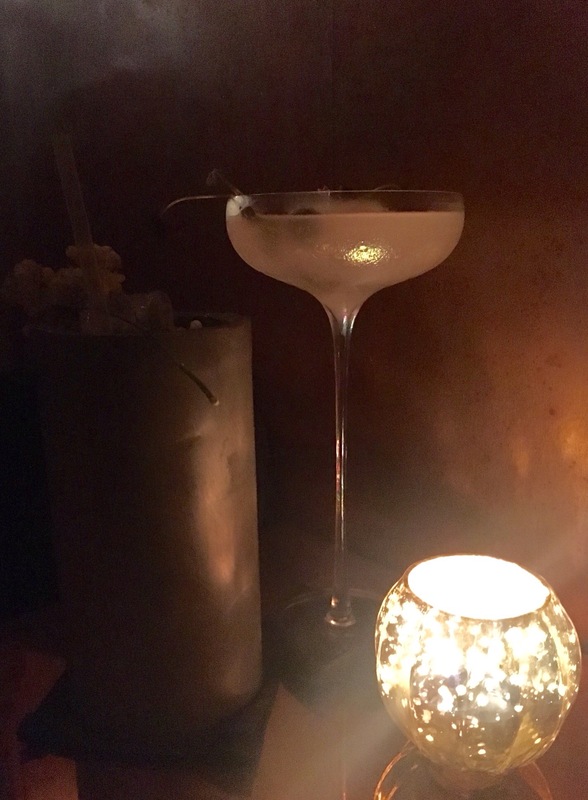 There was a doorman holding the false door open, so this element was no surprise this time, but the fun was that all the drinks were based on architectural styles. Eric chose a “Brutalism” which came served, appropriately, in a concrete columnar glass. Perfect. I chose “Modernism” mostly because it came in a very long-stemmed bowl cocktail glass which felt quite elegant. We chatted with the British waitress afterwards – the staff was responsible for the thoughtful drinks, and she told us they considered various ingredients for months before putting the drinks together. 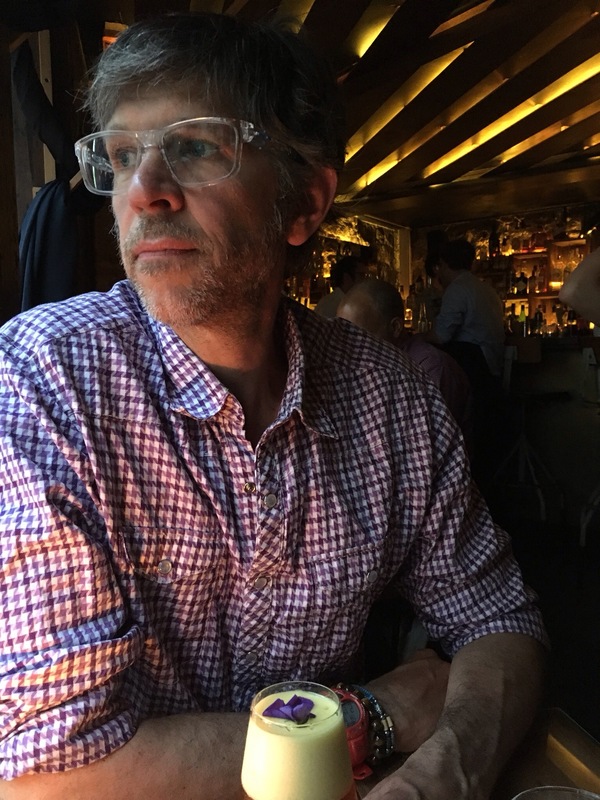 The Brutalism, for example, has ingredients that are all treated rather harshly – burnt roasted orange, oxidized vermouth – down to the coated and fried baby’s breath garnish on top which was indeed edible. I took a bite of the flowers, syrupy and crunchy without being overly sweet. The next morning, Eric woke up with a headache and nausea. “I feel terrible,” he groaned. “I think you might have a hangover,” I replied. “I only had two cocktails though!” he said back. Unfortunately, when you are generally a relatively light drinker of beer (no more than two a night) two cocktails with any possible combination of alcohols can easily do you under. 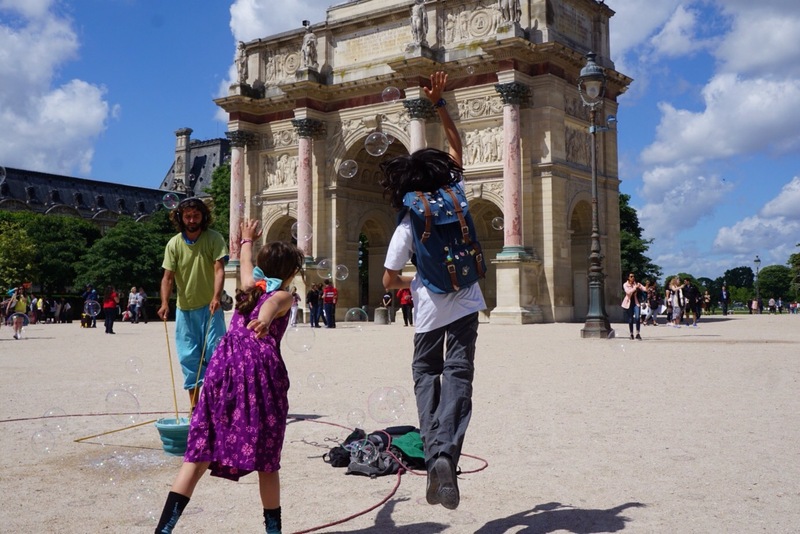 For better or worse, I was not so afflicted and so once it was clear that Eric wasn’t suddenly struck with meningitis or another life threatening condition, the kids and I took off to see the pyramid of the Louvre and then visit the Musee d’Orsay, complete with a picnic in the Tuilleries along the way. Most of the time when I’m out and about, I just put my money in a deep inside pouch of my backpack, but today I thought that with going into tourist territory, I’d be better off with my money in a fanny pack (yes, I do have one) right in front of me. 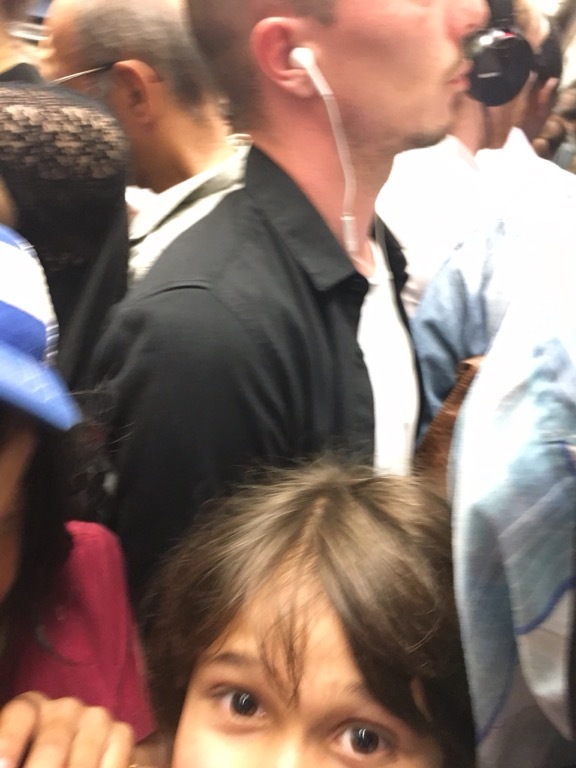 As we boarded the relatively empty metro at our first stop, I suddenly felt a few people shove into me forcefully and push me back. I was pushed into the kids, they were pushed into the people behind me, and I couldn’t tell what was happening. A group of British women behind me started talking about times when they were pickpocketed, which made me wonder. We were all crammed intogether in a small space, and then one of the women, teenager really, who had pushed me picked up my coin purse off the ground and handed it to me. Turns out – I HAD been pickpocketed! Given that my attention was entirely on the kids, I hadn’t noticed the group of women hanging around at the station looking for easy targets (me). When they pushed us all in, my focus was nowhere near my money and it was easy for them to zip open my bag and then lift out my coin purse. Now, I actually keep my credit card, driver’s license and a little cash in that, but if you were to pick it up it feels empty. After the thieves got off at the next stop, I checked my coin purse and saw that everything was still in it. The cash, about 50 Euros, wouldn’t have been a huge deal, but to lose my license and credit card would have been a real hassle. The British tourists behind me said that they thought that perhaps the would-be thieves returned my wallet because they felt found out, but I partly think it’s because they thought that there wasn’t anything valuable in it. At any rate, deep into the backpack went the little coin purse. I kept the fanny pack for my phone and for decoy. Mostly though, I felt incredibly foolish – here I am, someone who’s been all over and considers herself a savvy traveler, getting taken for the oldest trick in the book. Sheesh. The Louvre? Who cares! BUBBLES!! After this, we exited at the Louvre where I was triply careful, and walked past the pyramid. I gazed upon the I.M. Pei piece in wonder and gawked at the huge palatial buildings around me, the former Paris residence of Kings Charles V through Louis XIV. The kids saw “BUBBLES! !” and ran off to play, with barely a sideways glance at the architectural masterpiece. One of the really nice things about having more time in a place is that you don’t have to feel rushed to always be getting somewhere, so bubbles it was. 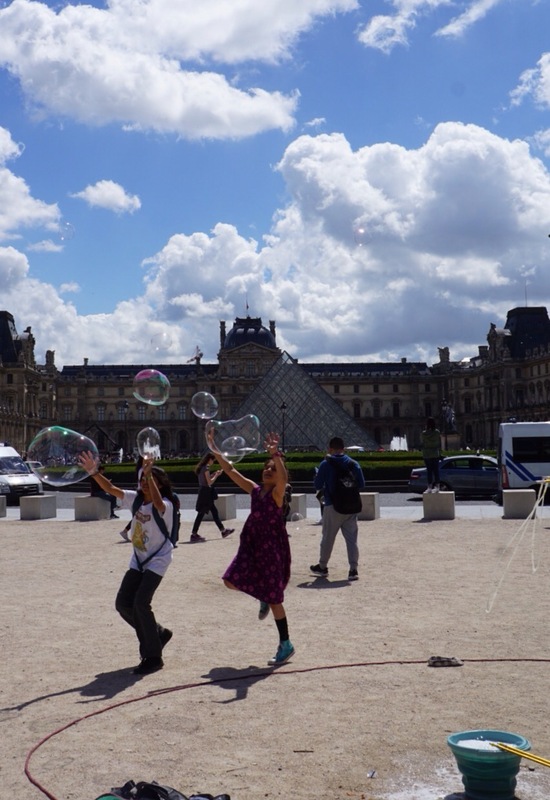 We spent about twenty minutes in front of the Louvre while they chased bubbles big and small in the sunshine, before heading to Eric Kayser to grab a baguette and some drinks. This time, I’d marked out a few places before we set out for our trip so we wouldn’t wander forever. 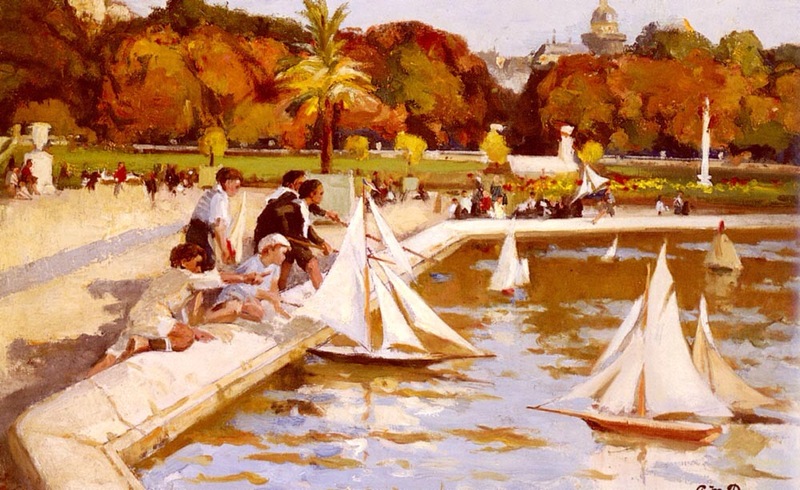 I’d brought some cheese and salad from dinner the night before, and we settled for a picnic in the Tuilleries. 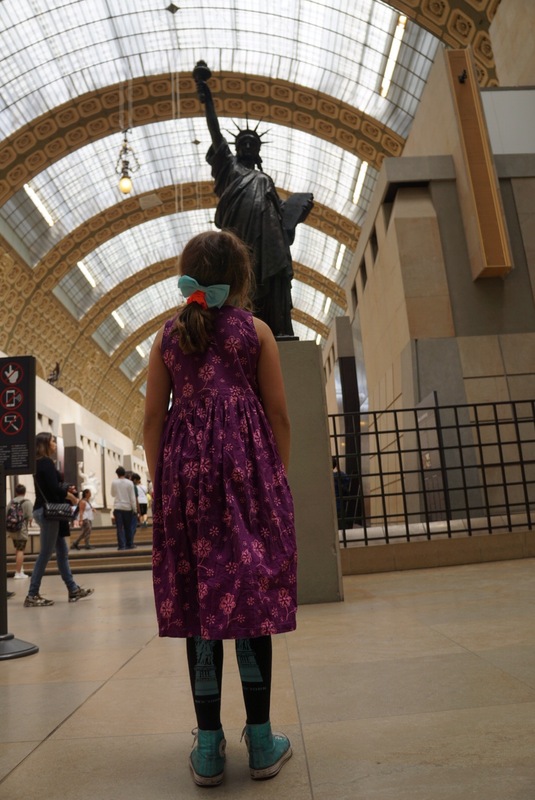 After this we walked over to the Musee D’Orsay, the Impressionist museum across the Seine from the Louvre. Housed in a former train station, the building itself is a gorgeous sight. I’d purchased e-tickets that morning, so we just walked into the museum and skipped the line. Side travel note: I cannot tell you how many times I’ve skipped a line buy buying e-tickets. Why everyone doesn’t do this is beyond me, since most of the people I see in lines are staring at their smartphones. I’ve even bought e-tickets while waiting in a line and then simply left and walked into the speed entrance. Granted there are times this isn’t possible, but for all others, why not? It is always, always worth the extra Euro per person. 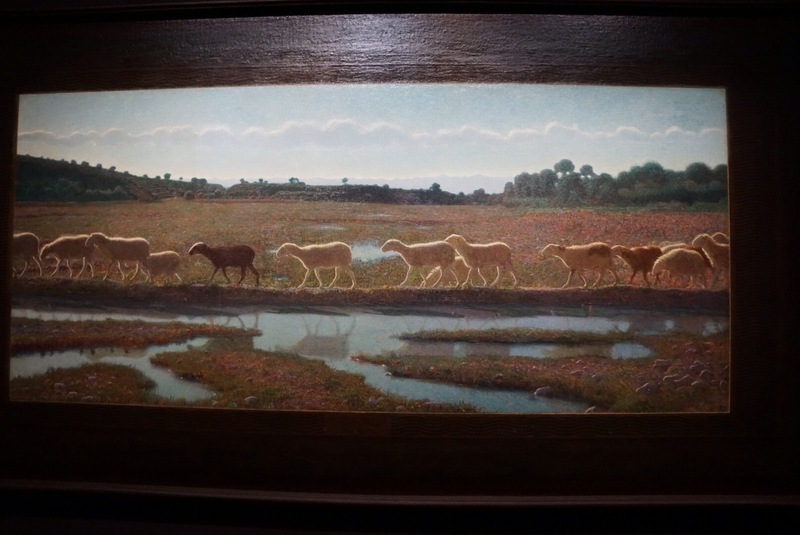 There’s an exhibition at the D’Orsay currently on spiritualism and Impressionism. It was packed. We moved slowly, waiting for popular paintings to be able to get in closer without pushing people. Whenever I go to an art museum, I always like to find an artist I like who I’ve never heard of before. 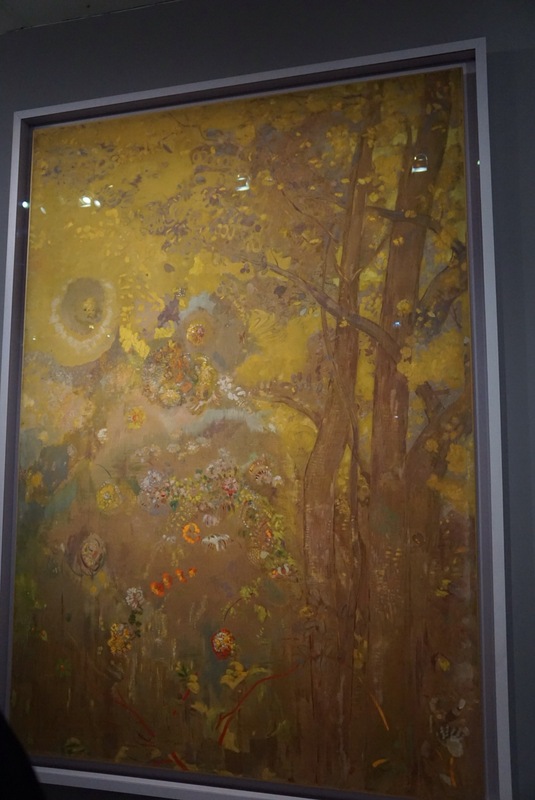 This time it was Odilion Redon, who paints dreamlike scenes that draw you into the miasma, so different from other impressionists who generally stick to real-life scenes, painted softly. While the kids and I were looking at an artwork, and I pulled the girl closer to me so that she wouldn’t be in someone’s way, I heard an angry British voice behind me (again with the Brits! What country is this?) “See there?! You just moved in front of me!! I was trying to read the information and you just moved right in my way!! !” I looked back at the man who was at my eye level and said coolly, “There’s no need for that. I wasn’t aware that I moved into your way. All you had to say was ‘Excuse Me, I can’t read the sign anymore,’ and I would have happily moved aside.” “Well! I can’t even look at a piece of art around here without people stepping in front of me! !” he exclaimed back. “It seems to me you need to work on your manners.” I admonished quietly. “My manners are FINE,” he said back angrily. “That’s … debatable,” I said. He moved on, and a French woman next to me said, “You guys are being fine! I don’t know what his problem is. Some people just want to be unhappy.” Indeed. We walked through the rest of the gallery, not letting the incident mar our time there, and later crossing paths with the French woman from time to time and exchanging words of amazement with her about the beautiful paintings. I CANNOT find the. name of this artist. Internet, if you know it, help. After a walk through the van Gogh and pointillism galleries, we headed back home to meet up with Rob, Dana and their son S who had flown over from Timisoara to meet up with us!! I’m again floored by people who take time and space out of their lives to meet up with us, and am always, always grateful. This time dinner was from a traiteur, a tip we’d learned from Bruce the bike guy. Traiteurs are takeaway catering places, and we’d walked by a Greek one near our house the last few days. 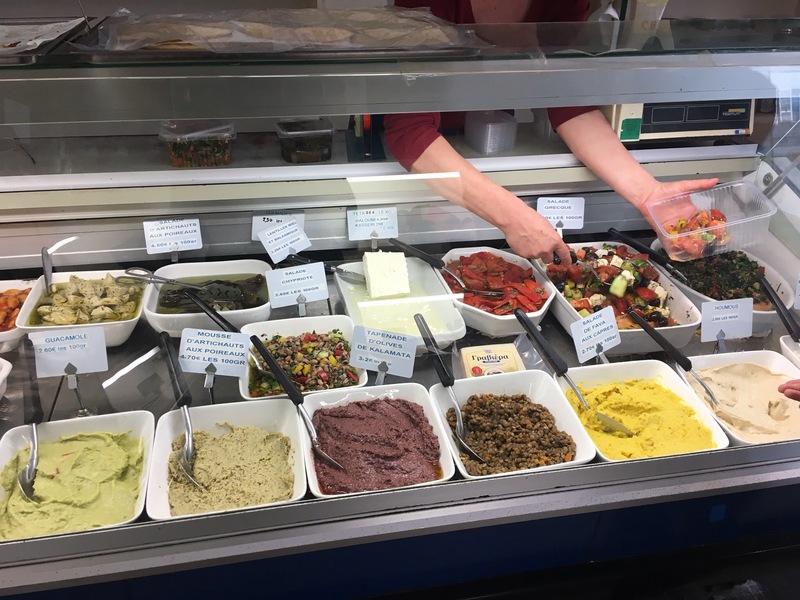 This time we went in and found a little place with a cooler full of delicious looking Greek spreads and foods. I asked if I could take a picture, and the woman there said “only of the food! I don’t even have any makeup on!” I told her truthfully that she looked beautiful, and snapped a few shots. We loaded up on dolmades, olives, hummus, artichoke spread, greek salad, tabbouleh, and sarmale that the proprietor told us “people come from far away to eat.” She wasn’t wrong, and we had a happy evening catching up over the delicious food.